Paul (aka Ditch) Keeling is all fired up about his work. 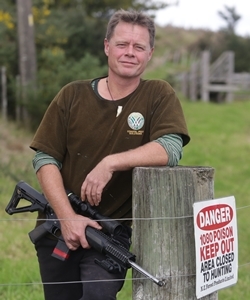 Keeping greater Auckland’s suburban and rural homes, businesses and farms pest-free requires this modern day maverick to act responsibly while carrying a big gun! – Do you cover urban and rural areas, and household as well as farm pests? I deal with all animal pests no matter where they occur, I spend most of my time working on farms and public parks, but I also help around 200 private homeowners a year. I mainly cover the Auckland region, but I will work wherever I’m needed and have worked on most of our islands including the Chathams. – What are the most problematic pests in the regions you cover and why? This area has pretty much every pest we know about! With one of the best climates in the country, everything flourishes and winter seldom kills anything. Rabbit numbers are big here, wasps do well, rats and mice favour the built up areas… the list goes on. Thankfully, Auckland Council is amongst the very best at managing these pests and has an incredible team. – Should people always employ a professional? In general, you’re always best to use someone who’s very good at what you need doing. That said, there are a lot of clever people out there and I often meet people who are controlling animals such as possums and rats quite well by themselves. Many others do fine once I have set them up with the right methods. – What pest control tasks ‘civilians’ should never tackle themselves? Big wasp nests – these can kill you! Pest bird work is tricky on lots of fronts and you need to get it right and anything involving shooting needs to be done perfectly every time. For this you really need someone who’s highly skilled. – Speaking as a hired gun, how concerned are you about minimising suffering? Most people don’t realise it but I’m actually an animal lover; I wasn’t clever enough to be a vet so found another way to work with animals. I truly love them all and feel so privileged to be in amongst them. I figure, if animals need to be killed, it’s best done by someone who has a lot of respect and feeling for them. – Do you hunt? If so, what do you prefer and why? I really enjoy hunting so it’s still a great relaxer for me. I generally hunt two to three times a week. It’s actually really nice to get out with a rifle and go for a long walk with none of the pressure that comes with shooting for work. I’ve never been a bird shooter, other than for work. I like to chase something that’s good to eat, such as pigs and deer, which are great fun and really nice on the table too! – There seems to have been an increase in hunting injuries over recent years. Is this really the case? If so, what’s going wrong? Hunting accidents are a shocker and every one of them hits me hard. The scariest part is that it’s so often experienced hunters who make the mistakes. Recent research has shown that decision-making processes are formed, in part, by previous experience. – whereas someone less experienced is likely to take greater care. These sorts of incidents suggest the more experience accumulated, the more likely you are to make a mistake. All shooters need to be 100% certain every single time; it’s that simple. – Is hunting damaging our environment? No. Every pest animal removed (and remember, deer and wild pigs are pests too) is a bonus for our environment. A key point often overlooked is that most lifelong hunters become ardent conservationists over time. They go in for the hunting, but can’t help but fall in love with the wilds. Our natural environment needs hunters, to protect it, to keep an eye on it and to enjoy it. New Zealand is a world leader in pest management and this is down to our long held hunting ethic. By hunting, we pay respect to our history, our ancestors and keep the Kiwi spirit alive! – If you could be the Minister of Conservation for one day, what would you do first and why? Simple, I would increase the pay for field workers! These guys and girls at the very coal-face dedicate their lives to protecting what is unique to our country for all of us. We owe them fair pay at least. – If you could invite any three people (living or dead) to dinner, who and why? Steve Irwin, I still miss Steveo and I think of him most days at work. In 2006, the world lost its greatest ever ambassador for wildlife in its natural environment. What I would give to just sit and listen to him! John Key. I think I like him, but I simply don’t understand how we can continue to advocate business with countries clearly at odds with our Kiwi ethos. We are encouraging the dominance of what is ours by countries that have the worst pollution, conservation and human rights’ records. I want to give him a kick in the shins for this! Maggie Barry [Minister of Conservation]. I’ve always enjoyed her approach and I would love the opportunity to give her some insight into the personal lifestyle of a conservation worker.